It may not feel like it yet, but summer is on its way at last, and that means breaking out the tank tops, light dresses, and shorts. Now, I love the look of a bandeau under a breezy tank or dress, but I hate bandeaus. They’re not supportive, and they’re constantly sliding down, causing constant wardrobe adjustments that contradict what is supposed to be an “effortless” look. Fortunately, bra tops have become more available as an alternative, but they can be pricy. 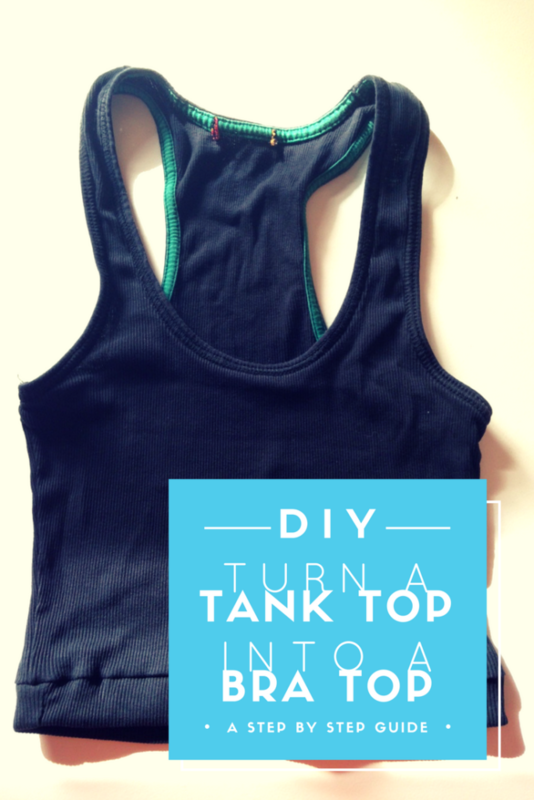 This tutorial will show you how to turn an old tank top into a bra top perfect for layering. I have a ton of too-small tank tops that I just knew I could do something with, and this is the perfect, quick project for getting ready for spring and summer. It will look like the above photo when you’re done. Materials: Tank top, coordinating thread, scissors, chalk, sewing machine that can do a zig-zag stitch. Step 1: Put on your tank top and mark with chalk where you want the top to end, adding an inch or so for seam allowance. 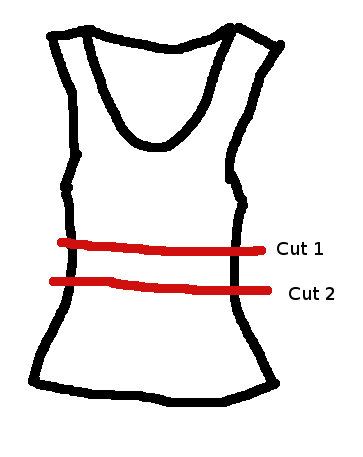 Step 2: Lay the tank top flat on the table and cut straight across where you’ve marked. Step 3: Measure about two inches down from the first cut and cut straight across again. This will serve as the finishing band for the bottom of the top. Save the remaining piece for a BONUS DIY! Step 4: If necessary, make the band smaller by taking in one of the side seams. I took mine in about an inch, just to be sure the bottom of the bra top would be nice and snug. Step 5: Fold the band lengthwise, so that the raw edges are touching and the seams are inside. Step 6: With the top of the tank right-side-out, slide the tank into the band and line up the raw edges and side seams. Pin all around. Step 7: Sew the band to the tank top with a zig-zag stitch. Step 8: Fold the band down and iron lightly. You’re done! I used a ribbed tank, but this can work for camis, too, even ones with built-in bras. Just make sure not to cut the bra elastic while cutting the top. BONUS DIY: Take the remaining piece of the tank top and turn it into a headband! Put the fabric loop on your head to check for fit. If it’s too big, take in one of the side seams. Repeat until you like the fit. Then just fold the raw edge in and sew with a zig-zag stitch. That’s it. Nothing wasted!